You may want to discuss with your students the nature of competition for resources. Although plants in theory compete for light, once the trees in this forest have leafed out they will absorb the vast majority of the light falling on this patch of land and they will outcompete the small herbs below. Some of these herbs have evolved to open their leaves and to flower very early in the year, before the trees leaf out, to absorb their light while they can. What are the costs and benefits of the strategy that the herbs use to gather sunlight? What are the costs and benefits of the strategy that the trees use? Plants compete fiercely for light; trees put a great deal of energy into building trunks and branches in large part to get above their neighbors and receive more light. 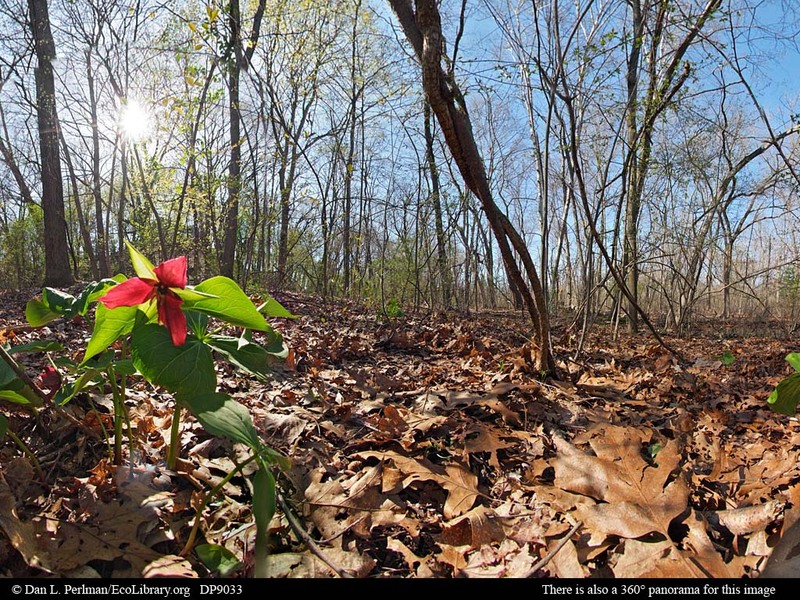 Herbs such as the red trillium, Trillium erectum, flowering in this image cannot compete effectively for light once trees have leafed out, nor can they flourish under the low-light conditions of the forest floor. Instead, these spring ephemerals leaf out and bloom much earlier than the trees above them so that they can receive the spring sunshine without interference. By the time the trees have leafed out and the canopy above has closed, the ephemerals will have completed most of their annual growth and reproduction.